I came across your site while trying to figure out the best value in marketing dollars. I own a mortgage company and my loan officers keep asking me to buy promotional items with our logo; i.e. Frisbees, magnets, rulers, pens etc. I do not understand how these items can increase my business. Are there any reports to compare ROI for promotional items and why exactly people think these are a good marketing tool? Your opinion would be appreciated. There is no easy answer, but I wrote a blog post about this (click here) and the first paragraph has a link to an Advertising Specialties Impressions Study that may shed some light on this question. My opinion is that maintaining “Top of the Mind Awareness” is important, but it depends on the frequency that your clients will use your service. I do question whether a novelty item like a frisbee has enough impact to get a Realtor to think about you over the other broker versus an item of value that helps them in their business. I think the money spent on promotional items could be redirected to a blog and providing information to your clients that will help them achieve more sales. A monthly case study about a difficult to finance situation or a newsletter with useful information can have more impact than a promotional item. client of mine who is a Mortgage Broker adds extra value by providing what she calls Affordability Sheets and Community Amenity maps printed in color that Realtors can give out at their open houses. It makes the Realtor look more professional and the 10 color versions of each are free. This gesture keeps her at the top of mind right when it counts; at an open house. She also takes donuts in to the real estate office in a branded donut box (https://themarketingguy.wordpress.com/thanks-a-dozen/) that gets attention too. This is strong stuff, but often promotional items are used as a crutch to take the place of a phone call or visit and historically people always look for the easy route. Compared to looking through a catalog and emailing a logo, it takes time to create something that adds value to another person’s business, but over the long term I think it creates a deeper relationship. can you measure the effectiveness? Next Post Have You Taken Sides in the Coffee Wars? Great posting. 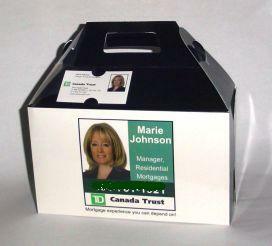 Promotional items can be very effective if you market yourself creatively. I have worked with a couple of Real Estate clients and came up with some very creative ideas. Don’t give a promotional item that everyone else does. Create your own identity.